I first met Bruno Fectay and Carine Bidaut, two young and dynamic people from the French Jura, at the first International Meteorite Fair in the historic town of Ensisheim, Alsace, France, in June 2000. Being a meteorite collector and enthusiast, I was more than impressed by their finds, such as the rare eucrites Smara, Igdi, Agoult, and Aoufous, the ureilite El Gouanem, and the R chondrite Ouzina. With the help of Bruno and Carine, I have been able to fill some gaps in my collection, and subsequently, not only did I become their regular customer, but we also became friends. As a private collector, I have made the observation that some meteorite hunters are only in it for the profit or the adventure; they roam the hot deserts in their search for rare rocks from space, and when they return, they just sell their finds off to the highest bidder. Not so Bruno and Carine. They don't sell all of their finds since they are collectors themselves, and every time I see Bruno carefully handling one of his meteorites I get an impression of his feelings of awe and affection regarding these chunks of extraterrestrial matter. Bruno and Carine share their love for meteorites, and they share a genuine interest in "what's going on in this universe", as Bruno puts it. I was suprised to learn that Bruno and Carine are quite new to meteorites. They began their journey just three years ago, one which would result in their becoming one of the most successful meteorite hunting teams. Prior to their involvement in meteorites they were into totally different things. Bruno comes from a paleontological background and had been dealing with fossils, while Carine was involved in archeology and ancient artefacts. So how does that fit with meteorites and meteorite hunting? For them, it has been an entirely natural affair. "When you are dealing with archeological artefacts, such as coins or pottery, you learn a lot about the evolution of culture," Bruno says. "And when you are dealing with fossils you inevitably learn a lot about the evolution of life, at least when you aren't in it only for the money. It's the same with meteorites: there's a lot to be learned about the evolution of our solar system, the formation of planets, the possibility of life on Mars, the origin of life itself, and so much more. We want to know what's going on in this universe, and we want to know it first hand, not only through books." Bruno is a man of action. For more than ten years he has been conducting paleontological expeditions to Morocco, and lots of fossils recovered by him can be found in various museums throughout the world. However, he admits that it's not just to his credit. He always had some native people working for him. While searching together for fossils, Bruno taught them what to look for, and after he had left, they would go out there on their own to find some new specimens. Once Bruno and Carine had their interests in meteorites kindled, they simply adhered to the same promising strategy; today a team of twelve people is engaged full-time in their search for meteorites in Morocco. "Without our team we never could have accomplished such a success," Bruno admits gratefully. "We accompany them for some months each year, educate them, teach them what to look for - and we pay them a nice monthly income. We even share our profits if it turns out that our team has recovered something of extraordinary value like a Martian meteorite. That's only fair, and it is the entire secret of our success. We are very grateful for their assistance!" "Of course," Carine adds, "nothing would have been accomplished without the help of various labs and scientists in France and throughout the world! We owe them our special thanks, although there are too many people involved in analysis and research to name them all. Without their enthusiasm and work nothing would have been done." Her statement reflects the fact that both support the scientific research appropriate for their specimens wherever they can. 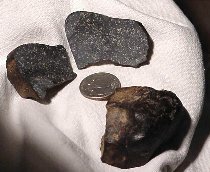 The main mass of their first Martian meteorite, the shergottite NWA 480, has been sold at a bargain price to the CNES, the French National Center of Space Studies. There, this unique sample of our red neighbor is being used in certain steps of the preparation for a future European sample return mission to Mars. If they had sold the NWA 480 on the private collector's market, they could have easily earned more than twice the money, since this meteorite has an extraordinary low total known weight of just 28 grams. And me, who am I? I'm Norbert Classen, a freelance writer and passionate meteorite collector. Since I created various websites in the past, Bruno and Carine asked if I was willing to help them create their new site. 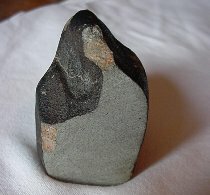 I agreed and contributed the structure and most of the content to this site - by that, not for money but for some meteorite specimens to add to my collection. I'd like to thank Bruno and Carine for this great opportunity, and I'd like to thank David Weir for his generous help in editing the English texts. If you have questions or suggestions regarding the content of Meteorite.fr, don't hesitate to contact me via email. 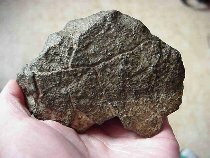 If you'd like to read more about Bruno's and Carine's meteorites, please have a look at the pages I just added. On the page titled Press Releases, you'll find links to various articles about Bruno's and Carine's adventures. The page titled Scientific Articles contains links to scientific papers and abstracts. Both pages will be updated on a regular basis. N.C.